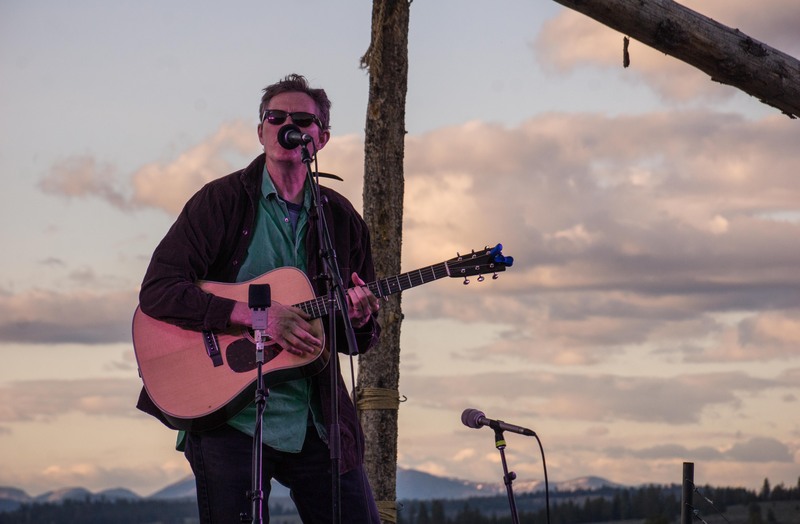 From the Grammys to Glamping, Robbie Fulks will be heading to The Resort at Paws Up for Campfire Stars at Paws Up on June 19–23. Robbie is a singer, recording artist, instrumentalist, composer and songwriter. His most recent release, 2017’s Upland Stories, earned year’s-best recognition from National Public Radio and Rolling Stone among many others, as well as two Grammy® nominations for folk album and American roots song. We were lucky to sit down with Robbie for a chat. Your last record, Upland Stories, was nominated for two Grammys in 2017. Did that bring your career more exposure? Did you attend the ceremony? I was there with the whole family. The bigger ceremony is telecast and that was the part I was expecting not to enjoy, but it was amazing. Beyoncé and Bruno Mars and all these people are great singers. It was like a positive presentation of the state of popular music today and the production was done very well. 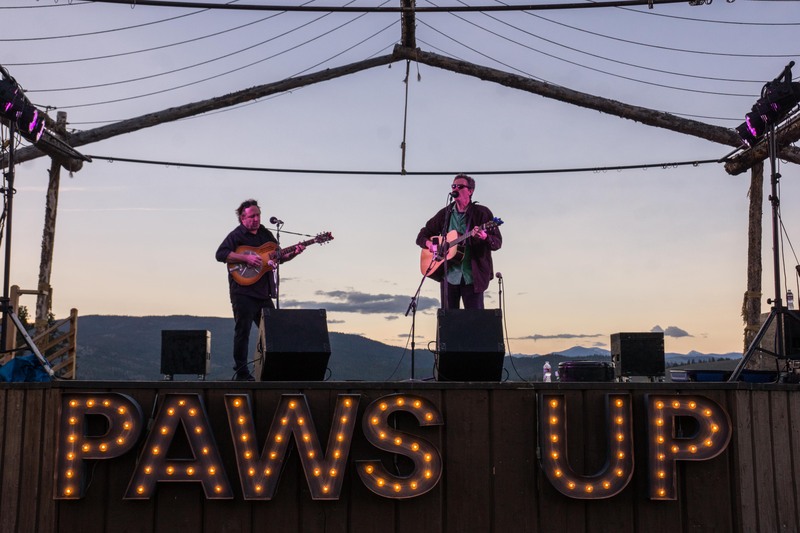 You performed at Paws Up during Montana Master Grillers 2015. What were your experiences at Paws Up like? It was super memorable. As far as gigs go, usually you travel someplace and you’re in and out, but at Paws Up, somebody picks you up and takes you out into the woods and you’re there for three or four days. And the amenities are unbelievable. You can hike. You can rappel. The food is unbelievable and the staff is really kind. Do you have songs in mind that you will play during Campfire Stars? No, not at all. The way that it works best for me is to go in and respond to the situation, to keep it in the moment. If you plan too much in advance, the audience can read it and it can seem scripted and gets a little bit robotic sometimes. What would you tell young people at Campfire Stars who might want to start playing music themselves? For me, music was a great thing to have early in life because it set up music as a verb, not as something that you just go and witness. It’s something participatory as well. It’s something that can be meaningful about where you live and what your ancestry is. So I try to reflect that now when I play. The Resort at Paws Up is hosting its first-ever Thanksgiving celebration with plenty of options to satisfy everyone’s tastes. 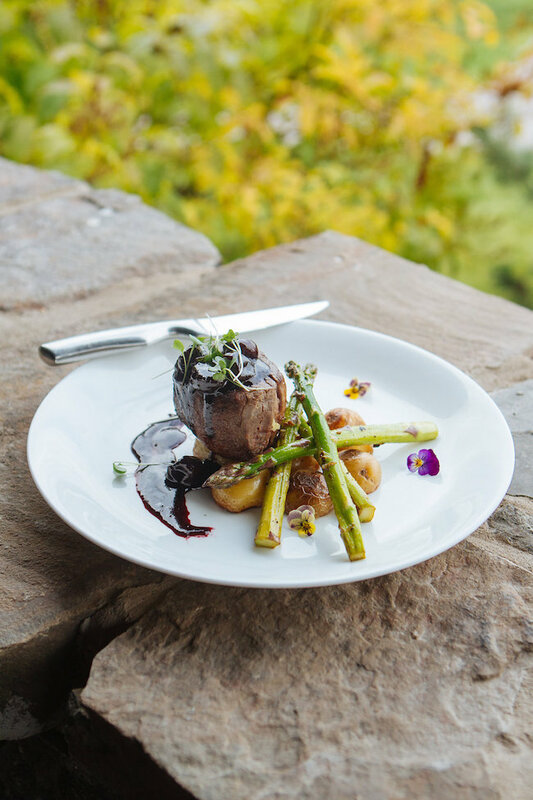 Bison Tenderloin with Cherry Demi-Glace is just one of our main course options. Of course, there will be plenty of turkey and an amazing crab-stuffed rainbow trout option, plus an array of sides, desserts and, of course, wine and spirits. Enjoy the recipe for our bison tenderloin, and feel free to pass it along to your family and friends. If you can’t find fresh cherries, purchase cherries in the freezer section of your grocery store. Thaw before using. In a large skillet, sear tenderloin in hot oil over medium-high heat. Season bison with salt and pepper; cook until medium-rare, turning bison on its sides to keep the cooking even, about 7 to 8 minutes or until desired degree of doneness. Simmer the port and cherries 45 minutes to 1 hour over medium-low heat, until the port and cherry sauce takes on a syrupy consistency. (Don’t overcook as the sauce can scorch very quickly.) Serve bison and demi-glace over roasted asparagus and potatoes, if desired. This recipe serves four. 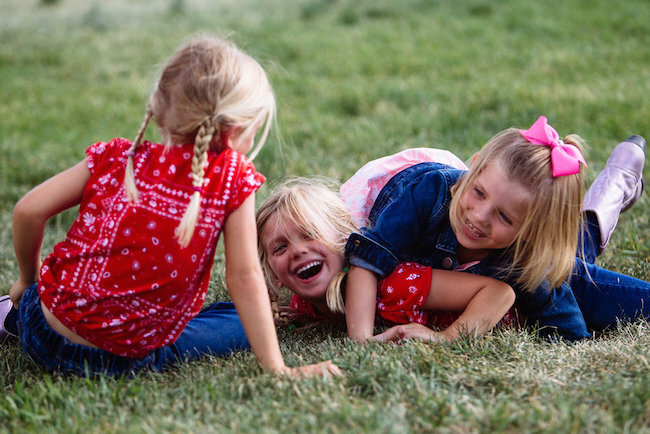 From a petting zoo with pony rides and family game nights to owl watching, hayrides and concerts, plus football and parade watching, there are plenty of options to satisfy everyone’s tastes. Take a hike, horseback ride, ATV ride or enjoy a spa treatment. To make reservations for Thanksgiving, please call 877-758-8644 or chat with us. 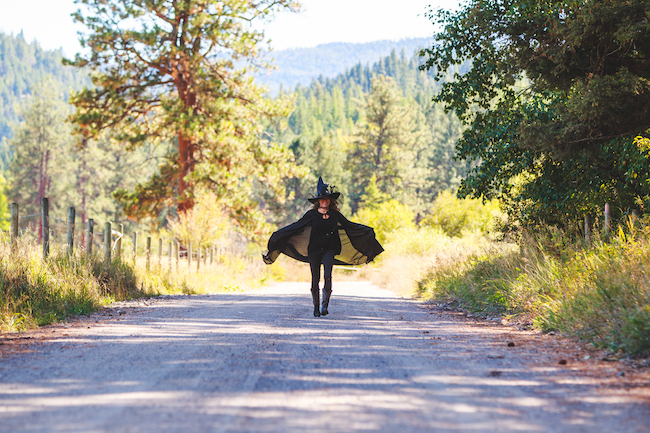 Enjoy 37,000 acres of pristine wilderness while getting the bejeebies scared out of you. 6:00pm–9:00 pm Dinner in Pomp—a la carte, please RSVP in advance. 6:30pm Meet at the Wilderness Outpost for your choice of activity. The zombie apocalypse has held all of us captive on shows like The Walking Dead, but here at The Resort at Paws Up, it has come to life. You and a team of other zombie hunters will embark on a wagon ride through the sinister woods of our 37,000-acre property. Zombies will limp after you as you hunt them with paintball guns. You had better be accurate or you might become their prey. The woods are spooky, dark and deep, and it’s time to cowboy up. Let your imagination run wild as you tromp through the forest. Did you see a ghost? Or was that a headless horseman? Who can be sure? Hopefully you make it back to the Outpost alive. 8:00pm–Midnight: Music in Tank plus craft beer flight tasting, a bonfire and s’mores. 8:00am–10:00am Breakfast at your leisure. 9:00am Meet at the Wilderness Outpost for your choice of activity. 11:30am–2:30pm Lunch at your leisure. Come dressed as your favorite outlaw or bandit and win your dinner! If you receive first prize in the costume contest, your dinner and drinks will be on the house. 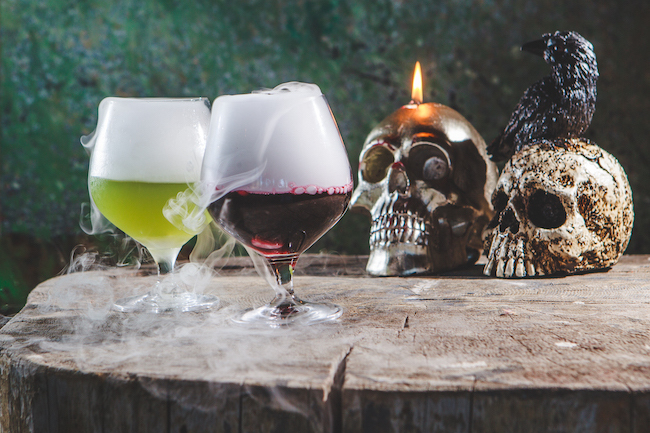 To make reservations for Halloween, please call 877-758-8644 or chat with us. 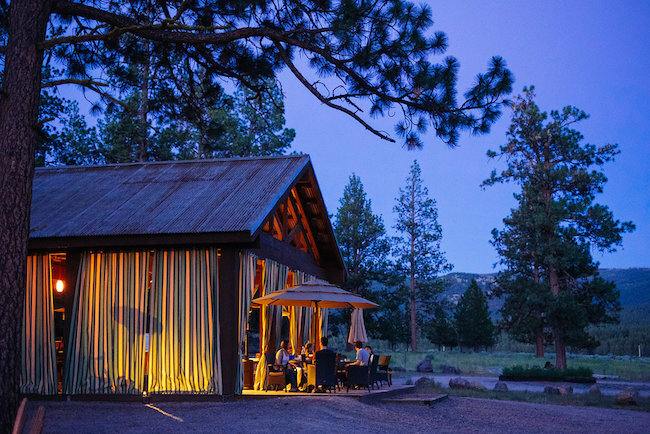 Luxury camping at The Resort at Paws Up is nature served on a gleaming silver platter. 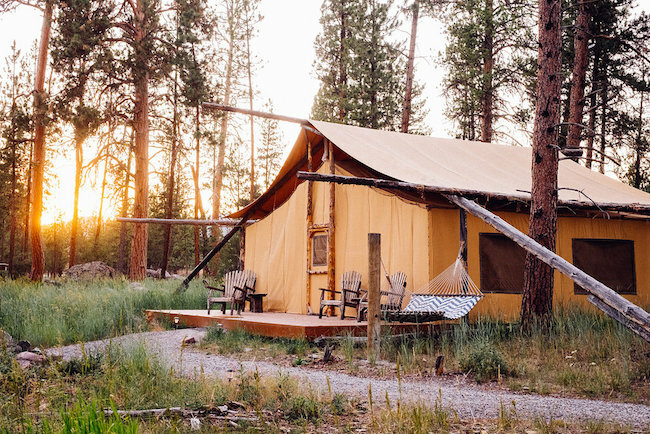 Known as North America’s premier glamping destination, The Resort at Paws Up features five luxe tented camps that cater to families, couples and groups. Each safari-style tent features fine linens, comfortable beds, chic rustic furnishings, art-adorned walls, electricity, air-conditioning, heat and—most importantly—a camping butler at your beck and call. 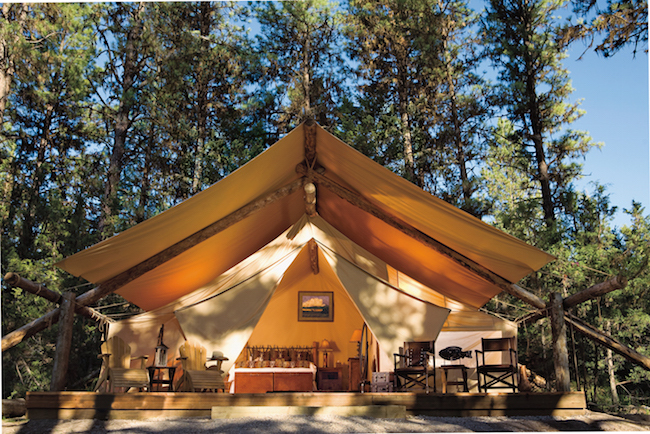 Learn from our Resort Manager, Charles Daenen, and our Glamping Operations Manager, Eddie Young, how we turned old-fashioned camping into glorified glamping. 1. What are the necessities to “glamp” up a camping experience? Charles: Be flexible. You are not checking into a five-star suite with a 50-inch television and a minibar, but you are getting ready for an experience of a lifetime. Eddie: Lots of s’mores, a sturdy pair of boots and a mind that’s open to new and fun experiences. 2. What’s the funniest request you’ve received from a guest? Charles: I was once asked to sing happy birthday in my native language—Dutch—and it sounded awful, as I cannot sing. But I made the entire group laugh. 3. What about a guest’s most unique request? Charles: A guest wanted to have one of our ponies come to a camp and stay next to her child’s bed inside the tent until she fell asleep. Eddie: I had a guest who wanted me to try to get an elk close enough to touch. 4. 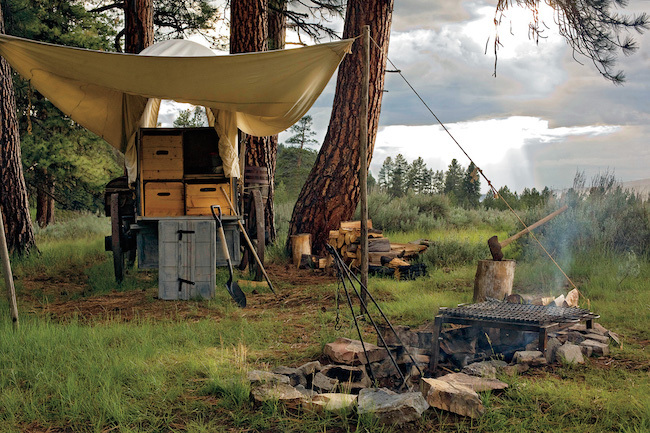 What necessities should a guest bring to Paws Up glamping tents? Charles: An open-minded attitude. You are going to experience a vacation like nothing you’ve done before. Eddie: The tents have pretty much everything you could need, and if they don’t, we can get it for you. 5. 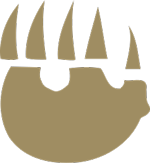 What is the most unique aspect of Paws Up? Charles: There are actually two things that make the glamping adventure unique: the location and the willingness of the staff to go the extra mile time after time. If one of those two things was missing, it just would not be the same experience. Eddie: Our employees at Paws Up are special. They are friendly, genuine and passionate about giving our guests a great glamping experience. 6. Where is your personal ultimate favorite place to camp? 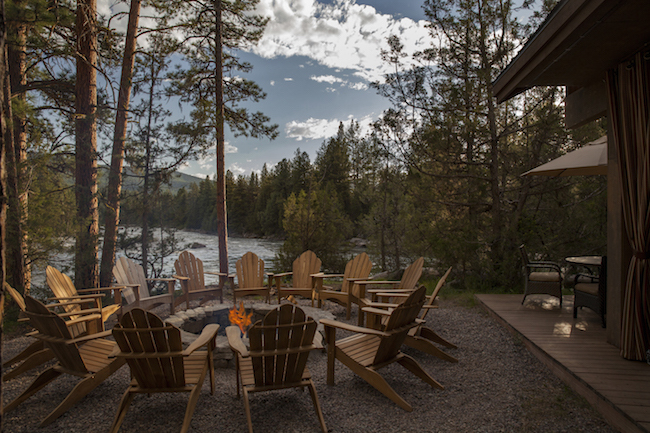 Charles: The deck of Cliffside Camp early in the morning, drinking coffee and watch the sunrise while eagles soar above the Blackfoot River looking for breakfast. Eddie: All camps have features that make them individual, and I can honestly make a case for each being my favorite. Moonlight Camp has a special place in my heart, as it was the first camp I worked. 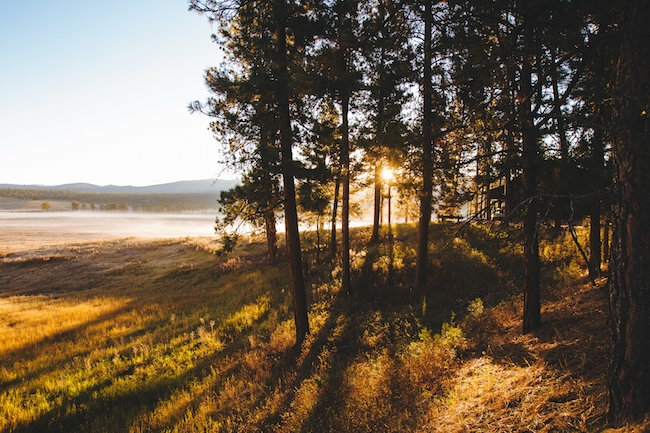 It has the true feel of camping, being out in the open meadow and away from most of The Resort, so you definitely feel like you’ve stolen away. 7. If you could tell guests one thing before they visit Paws Up, what would it be? Charles: Do not hesitate to ask us anything, no matter how crazy your request is. We want to know what you like, but we are also really good at anticipating your needs. Eddie: Be prepared to get dirty! 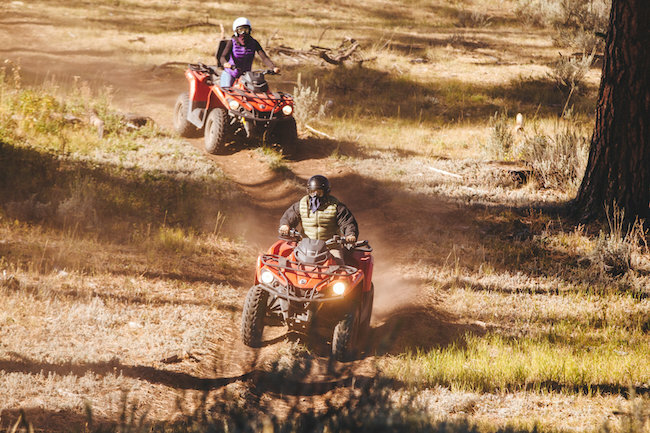 Whether you are on ATVs, horseback riding or sitting around the campfire, it’s the great outdoors, so—naturally—it can be dusty and dirty. A good pair of old jeans is sufficient here, as we don’t want to ruin your good pair. 8. What’s the one thing you see guests most often forget to pack? Eddie: A cowboy hat. If you don’t have one, don’t worry. We have a huge selection of hats in the Wilderness Outpost, and you will be feeling country in no time! 9. If you could have one famous camper come stay at the ranch, who would it be? Charles: Bear Grylls—I’d love to have him run a wilderness workshop. Eddie: Louis L’Amour. I grew up reading my dad’s old books while we were camping, and he was by far my favorite storyteller. I would love to sit around the crackling fire as he told stories of the Old West, gun-slinging cowboys, outlaws and bandits that would keep me intrigued for hours. 10. How did you become a camping butler? Charles: I am too old for that now, but if I—just like Cher—could turn back time, this would have been my favorite summer job. Most of our butlers are referrals from other employees. Eddie: I started working at the Resort as a summer job during college, and it has easily become one of my favorite jobs I have ever held. Being outdoors and helping guests enjoy themselves while glamping is a fun and challenging job, but it is highly rewarding when you see the smiles and continually have guests who don’t want to leave at the end of their stays! 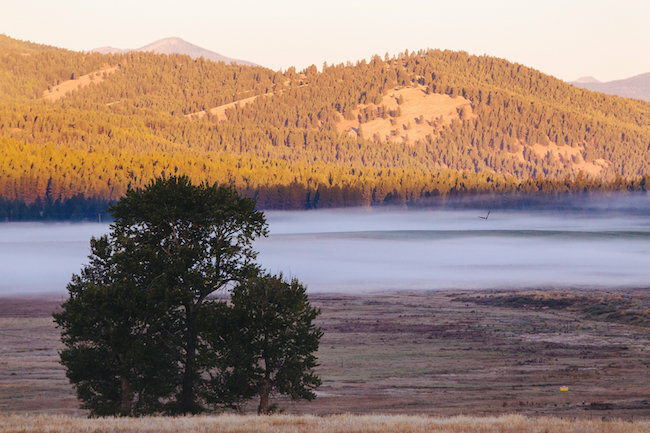 At The Resort at Paws Up, you can experience so much more than a typical Montana dude-ranch vacation. Besides glamping in luxury, safari-style tents, you can partake in a multitude of outdoor adventures, once in a lifetime experiences and unique activities, which are more than plentiful at The Resort. 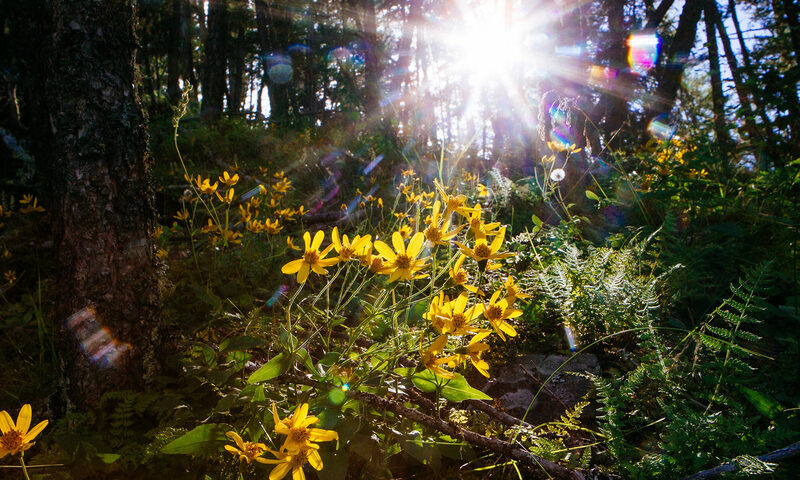 Check out these three super cool activities ideal for a summer Montana vacation—there are exciting discoveries at every single turn. A ghost town via ATV? Yes! For those looking for a gorgeous, scenic route and adventure, this five-hour trip is a rush. You will leave the property and head to Elevation Peak for lunch. 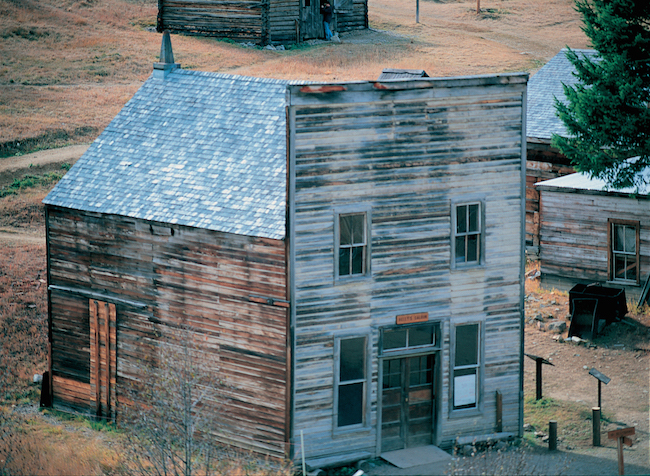 Then, take a tour of the ghost town with your guide before continuing this exciting journey. Looking for a challenge by bike? 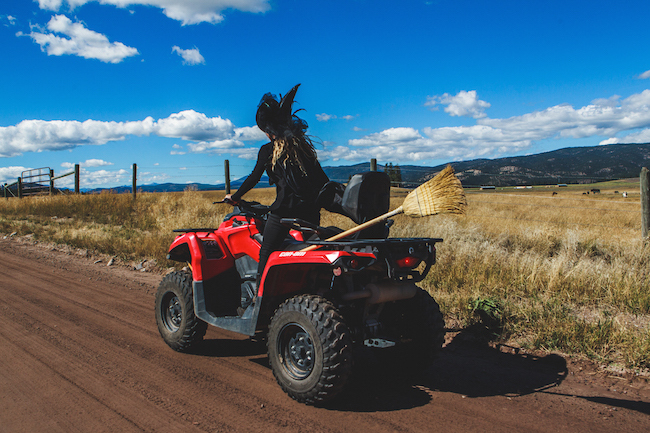 Approximately four hours, this tour takes guests, by van, to Garnet Ghost Town, where you will have the opportunity to explore this historic site before hopping on mountain bikes to make a 12-mile downhill trek. 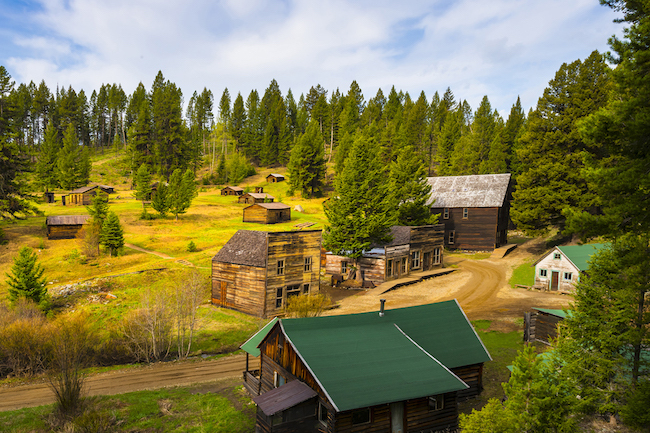 Get your workout in and explore an historic ghost town all at once. 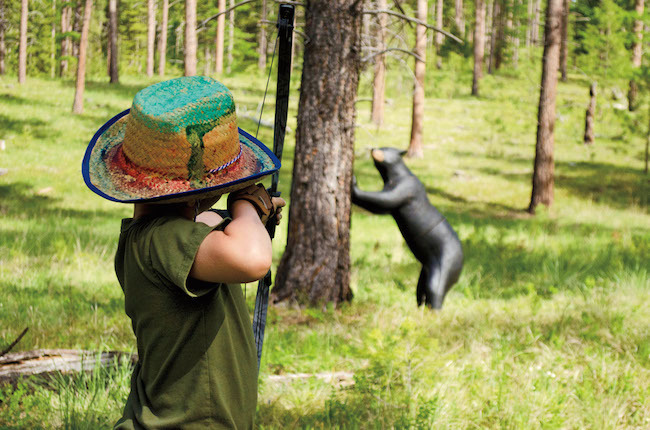 Looking for the most fun and unique dining experience in Montana? 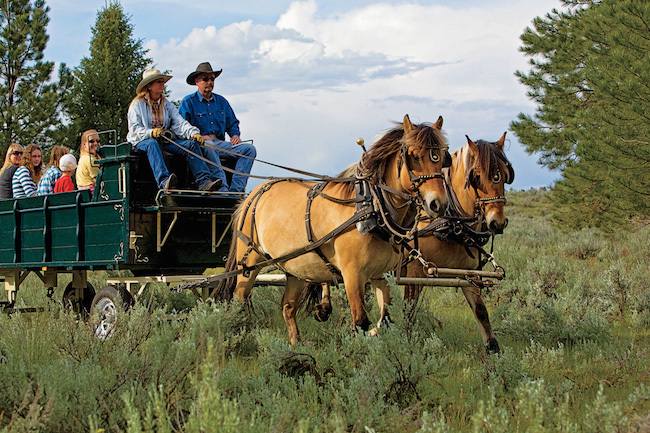 Step aboard Paws Up’s version of an old-fashioned horse-drawn wagon for an evening ride to the Blackfoot River. 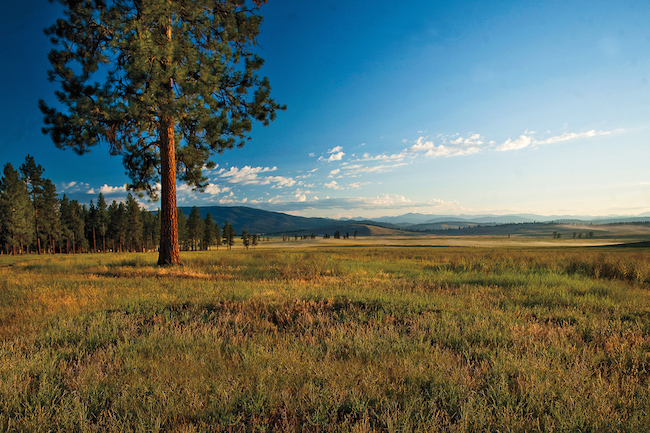 Sit back, relax and take in Montana’s fresh air and beautiful Big Sky—there’s lots of both!—the backdrop of The Resort at Paws Up. The Chuck Wagon Dinner begins at the banks of the Blackfoot River, where you will enjoy an authentic dinner prepared before your eyes. 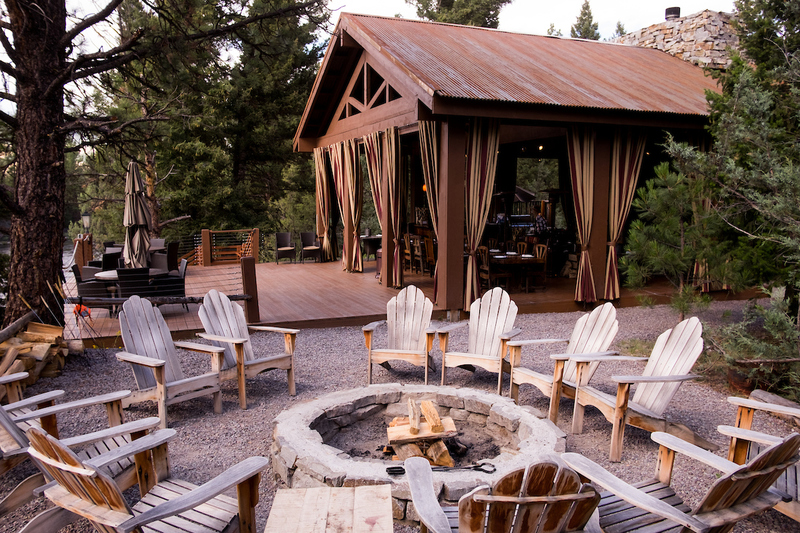 From all-natural chicken, Angus prime rib, fresh corn and asparagus grilled over a campfire to summer classic dishes such as baked beans and fresh fruit cobbler cooked over the coals in a Dutch oven, we promise you won’t walk away hungry. Further enjoy this cowboy-style experience by pitching horseshoes with the kids, listening to a local banjo player or contemplating a few words from a cowboy poet. This is one family dining experience that you will remember for years to come.